It’s that time of year again, with the darker nights, colder days and Christmas just around the corner, it’s time to get out those winter warmers. Whether it be work or pleasure, corporate or casual TJ Klothing have a vast range of clothes to suit most occasions, so why not shop our huge collection of outerwear for your winter outfits or uniforms. 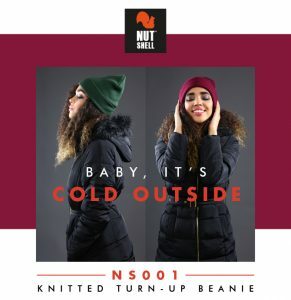 Nutshell– For a stylish cold weather accessory you’ll turn to every year, choose a Nutshell beanie. This versatile beanie is simple, trendy, soft to the touch, easy to wear and easily adapts to your style with a choice of turning up the cuff or keeping it a simple slouch beanie. It’s wonderfully warm and cosy too, available in 40 colours to match in with every outfit. Nimbus- Nimbus the Scandinavian Apparel -This fashionable Lewiston Gilet (pictured left) has nicely hidden pockets with zippers and a stand-up collar with comfortable knit on the inside. The fitted design, combined with the practical draw cord at the waistline, makes Lewiston an indispensable piece of clothing during all seasons. Nimbus has a wide range of smart casual outer clothes that can be layered together. 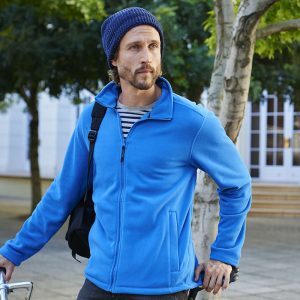 Stylish fleeces, quality jackets, fashionable Softshells or stylish hoodies, timeless elegance for business or leisure. 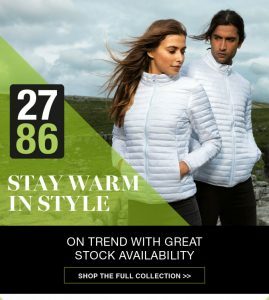 2786– Stay warm in style with this 2786 Tribe fineline padded jacket. The horizontal stitch detail combined with a streamlined tailored cut creates a fantastically modern look. The slim padding keeps you warm when the temperature drops, yet is light enough to wear for any weather, making it the perfect jacket choice to update your wardrobe this season. 2786 has it all wrapped up with their vast range of trendy jackets. Craghopper– Kiwi 3-in-1 jacket AquaDry waterproof technology with Interactive fleece and brushed inner collar. Outer 100% Polyester with polyurethane coating, Inner 100% Polyester. 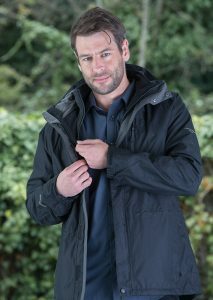 Great jacket for work or pleasure along with Craghoppers range of outerwear and workwear. Regatta- Full-zip microfleece Anti-pill symmetry fleece, layer-lite technology with 2 zipped lower pockets. Weight 210gms. If you love the outdoors, you will love Regatta whether it be work or play. Regatta has a full range of outerwear to keep you warm and dry no matter what the weather. Waterproof classic jackets, insulated body warmers, rain suits, hard wear workwear to name just a few. Christmas- Finally ’tis the season for giving. 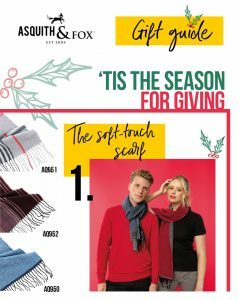 Looking stylish whilst keeping warm is easy with this Asquith & Fox lightweight two-tone scarf. A fine knit using two coloured threads to create a contrasting two tone effect. Soft brushed back knit for a soft hand feel and finished with fringe decoration. Perfect for men and women, ideal for personalisation. Treat someone special this Christmas and check out our Christmas shop for other gift ideas and don’t forget to take a look at our wide range of Christmas Jumpers and novelties. Hope you all have a very happy Christmas!